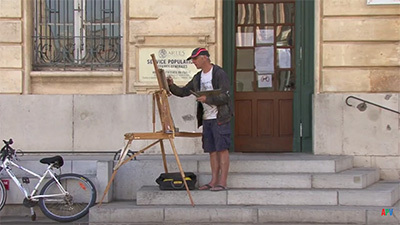 James always carries a sketchbook in his pocket and has amassed a wonderful collection of sketches over the years. 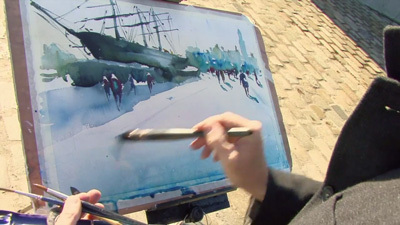 Working in his studio, James shows us how to paint watercolour landscapes from them. He selects views of the Lake District and the Windrush river and gives detailed instruction on how to paint the main elements of a landscape: skies, clouds, mountains, trees, buildings, water and reflections. 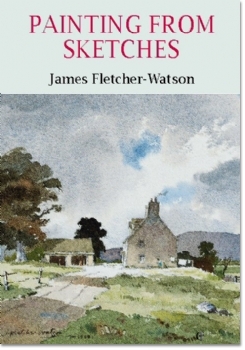 James Fletcher-Watson's many admirers who have enjoyed his previous videos, The Magic of Watercolour and Outdoor Painting, will be delighted to know his latest is now available. They will be familiar with his excellent technique, which is in the best tradition of British watercolour painting, and will be eager for more. 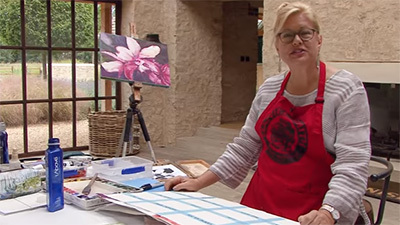 In his latest video, James shows us how to paint watercolour landscapes in the studio using pencil sketches made on the spot. He has an artist's eye for choosing subjects, for developing them into balanced and pleasing compositions, for making the most of tonal contrasts and for interpreting colour. He emphasises the value of preliminary sketches and we catch a glimpse of his many well-used sketchbooks. His first subject is an attractive Lakeland scene, with a track leading up to a stone cottage, and a mountain to the right balancing a large oak tree to the left. Having drawn the main elements of his subject on Saunders Waterford watercolour paper, he begins with the sky - cloudy with a little blue here and there. 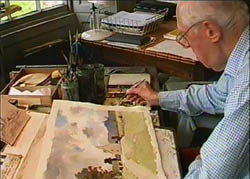 He first damps some areas of his paper with pure water, then applies a wash of French ultramarine and burnt umber for the grey of the clouds, French ultramarine for the blue of the sky and finally adds a little cobalt for the blue of the sky nearer the horizon. 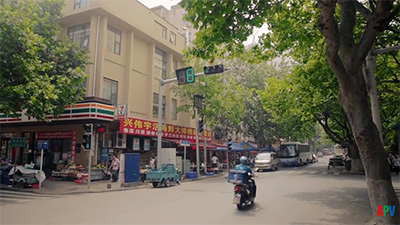 This cloudy sky enables him later to add effective cloud shadows to the scene below. When the sky has dried, he paints the mountain with a wash of French ultramarine and light red and shows us how he skillfully captures the low cloud resting on the summit. The cottage and an adjacent stone barn are quickly established with washes of raw sienna and French ultramarine, and he later uses a mixture of raw umber and cobalt for the slated roofs. The late summer grass is a mixture of cadmium yellow and Winsor blue, slightly dulled with burnt umber. He tackles the interlocking foliage masses of the big oak tree boldly with a strong mixture of burnt umber and Winsor blue, to which he adds raw sienna for the lighter parts. Further deep toned trees provide effective tonal contrast with the stone barn and with a line of washing, which provides a crisp accent. The final addition of foreground cloud shadows completes a most effective watercolour that is an object lesson in how to tackle a landscape simply, confidently and effectively. 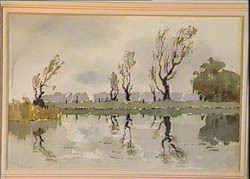 The subject of his second demonstration is the Windrush with trees reflected in the calm waters of the river. Again he begins with the sky - this time a rather cloudier one. There is a small patch of blue just above the horizon, which enables it to be reflected in the water below - an example of an experienced painter's forward planning! The reflections are simply and boldly painted with their form suggesting the gentle movement of the water. 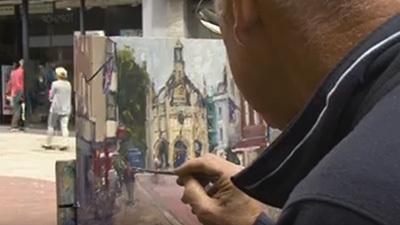 In this delightful one-hour video, James's sound advice on colour, tone value and much more, together with his deceptively simple watercolour demonstrations, will be of real value to aspiring artists of all standards. I warmly recommend it. 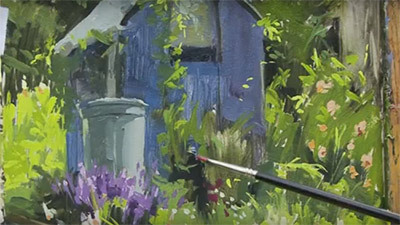 How to paint large studio watercolour from small location pencil sketches is expertly demonstrated by James Fletcher-Watson in his new video Painting from Sketches. Working in his Windrush studio, James selects two recent drawings from his numerous sketchbooks and shows how, by referring to this information and �living again in the moment when you were sitting there�, you can recreate the feeling, atmosphere and particular magic of a subject. His demonstrations, of a view in the Lake District and a river scene, are a joy to watch and are well supported by a wealth of helpful tips and advice. 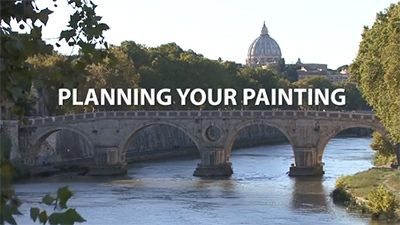 All the main elements of landscape painting are covered, including skies, clouds, mountains, trees, buildings, water and reflections.